The Ponderosa wood post is designed to last. The beveled shape of the holes that are drilled into our posts allow for superior rail stability while permitting the rail to flow easily over various types of terrain. All of our wood posts are drilled first, then pressure-treated. This allows the treatment to reach the outside of the post, as well as the exposed surface inside the drilled holes, to ensure the longevity of the wood. 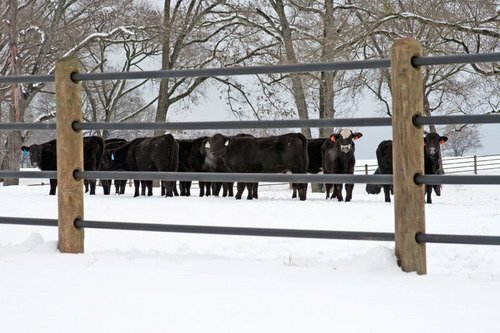 Additionally, the top of each wood post is domed for safety and to assist with water shed. Thoughtful engineering went into the design of the holes that are drilled into our wood posts. The holes drilled for tubing are cone-shaped to allow for flexibility over rolling terrain and in and around curves. This innovative design fits the outer diameter of the tubing in the center of the hole, while allowing the rail freedom of movement toward the outer dimensions of the drilled post. 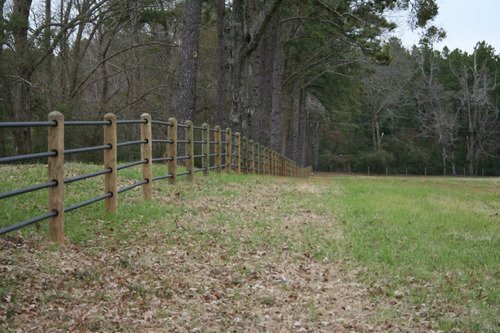 Priefert's rail-in-rail "swedge" design allows you to construct a fence with a single rail running from post to post in any length, creating a beautiful fence that flows with the contour of your land. At corners and gates, Ponderosa Post Connectors are used to connect the tubing to solid posts. Utilizing the same "swedge" concept, these post connectors allow for maximum versatility, as well as the expansion and contraction of the tubing. Each end of the tubing is cut to exact length, the connector slides or "swedges" into the tubing, and connects to the post with two lag bolts. Wood posts are pressure treated after all holes are drilled. Post come with domed top for safety and water shed. Post connectors allow for expansion and contraction. Powder coated over galvanized tubing. Contact us for additional information and ordering.